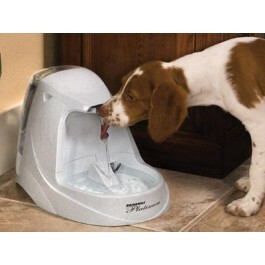 Drinkwell®'s most advanced pet fountain. The Platinum features; a new snap on lid to prevent accidental removal, a pre-filter to catch large particles before they reach the motor, and a new submersible pump for nearly silent operation. With the same quality that consumers have come to rely on, the Drinkwell® Platinum is a culmination of 10 years experience in making pet fountains. Proven to benefit your pet's health, the Drinkwell® Pet Fountains are a great way to show your pets just how much you care. Our research shows that one of the best ways to improve your pet's health is to get them to drink more water. And the best way to do that is with the Drinkwell® Pet Fountain. By using a 5-inch falling stream of water, the pet fountain continually aerates your pet's water with healthful oxygen. A charcoal filter also removes bad tastes and odours, giving your pet the best possible - and most appealing - way to stay hydrated! The reduced ramp splashing due to the flow of water. Submersible pump with a virtually silent operation.